It’s 6 P.M., an hour-and-a-half past sunset, and the Tuesday night ride is rolling. The moon is late on the rise, and twilight has faded from blue to black. Our light parade streaks through the winter woods, lighting them up like a stuttering black-and-white film starring spooked white-tailed deer and schizophrenic squirrels. The fourth season is prime riding time in Alabama, when the trees shed their impenetrable curtains of leaves to reveal the lovely curves of the land. "Y'all wanna ride more? Or eat?" Life is filled with tough choices, but this is not one of them. Because someone has already gone back to fire up the grill, a gesture of hospitality that means the rest of us can have both. Soon there will be barbecued chicken, grilled mushrooms and Conecuh sausage–pork links so profoundly unctuous that they're reason enough to visit Alabama. But first we have our own shadows to chase through the dark and spectral woods. This is a story about a community mortared with sweat and dirt and charred meat. It's the story of a small tribe of riders–the Central Alabama Mountain Pedalers (CAMP)–that took a handful of ragged legacy trails and quietly transformed a modest state park into one of the region's unsung riding destinations. At a time when almost every state park in Alabama is teetering on the brink of insolvency, CAMP's new trails have skyrocketed park attendance and anchored Chewacla solidly in the black. Mostly, though, it's a story of taking molehills and making mountains. "This is where the Piedmont Plateau and Coastal Plain meet," says Phillip Darden, the founding president of CAMP. We're standing on the highest point in the park (elevation: 608 feet) overlooking Chewacla Creek cutting through a valley some 350 feet below. "The very last foothill of the Appalachians is said to be in this park." Elevation, it would seem, is not one of the park's biggest assets. And yet, after a mellow climb, we drop into High Gravity, a frisky flow trail with small kickers and berms, and it delivers more downhill groove than should be possible in the zero-sum world of topography. Good trails are like that– they stretch the limits of their landscape. Woven into Chewacla's current 26-mile web of singletrack is considerable history. In the late 1890s, coeds pedaled a 6-mile dirt bike path between downtown Auburn and Wrights Mill, a historic grain mill in these woods. In the 1930s, Civilian Conservation Corps workers built walking trails, cabins and a dam that created a 26-acre lake for swimming and fishing. In the early '90s, as mountain biking was on the rise, the park hosted the NORBA Nationals–the first time the race had ever been held east of the Mississippi. But the sport waned, and by 2000, all that was left was a smattering of poorly kept trails. Park attendance plunged. Some blame factors other than mountain biking. "One theory is that the tanning beds killed Chewacla," says CAMP member Hank Albritton. "Because the girls came out to lay out and the guys came out to watch them." Around 2011, a new generation of mountain bikers emerged and about a dozen devoted builders started crafting singletrack. "The majority of us had never built a trail in our lives," says Darden, who helped write the first $100,000 grant to improve 26 miles of existing multi-use trails within Chewacla. "We had no idea there were so many trailbuilders in an area without trails." CAMP officially formed in 2012, and it has created a nice variety of trails, ranging from beginner-friendly with progression built in, to hand-built trails with texture and options and a small skills area with the state's only wall ride–a 15-foot-high arc with a 70-degree angle. Some of the best trails in the park aren't about speed or skill, but scenery. Creek View parallels Chewacla Creek, which converges with Town Creek at the Natural Falls, a wide cascade that tumbles into a social swimming hole. "It's the most scenic spot in the park," Darden says. "It's like something you'd see in North Carolina." 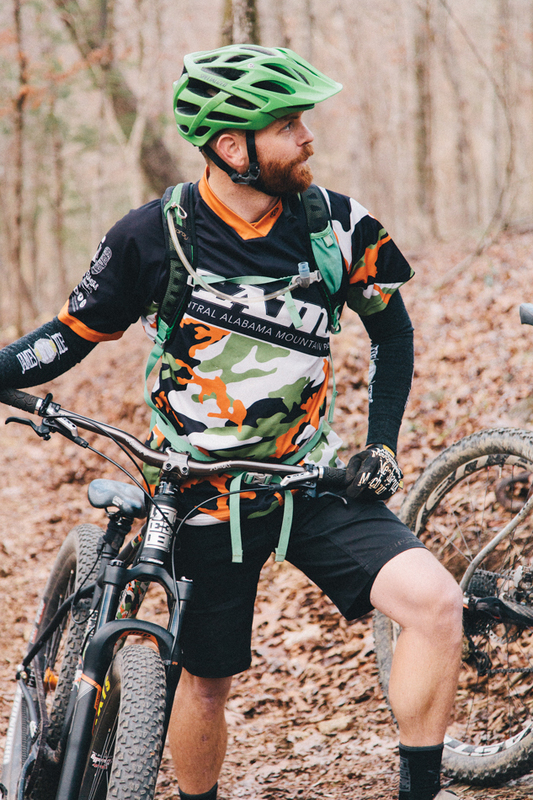 Chewacla's size–not quite 700 acres–means it often gets overshadowed by bigger destinations like 9,940-acre Oak Mountain State Park outside Birmingham and Coldwater Mountain in Anniston, where the goal is 50 miles of singletrack and IMBA Ride Center status. CAMP is not huge–it has 80 or so members, with 20 pulling active trail duty–but it has gelled into one of the tightest and friendliest fat-tire groups in the state. The club awards a belt buckle to every member who volunteers more than 100 hours of trail work. They've awarded 16 buckles so far. Some are worn every day. Even with shorts. It helps that the park sits just 5 miles from town, perfect for a ride or trailbuilding break during lunch or on weekdays after work. Chewacla also serves as the training grounds of two high-school mountain biking teams, which saw 28 kids in 2015 and aims to have 50 kids racing this year. For a trailbuilder, the ROI of fun-per-mile may be hard to calculate, but the park's attendance numbers say it all. "This park was teetering on profitability," says Dell Banks, park manager (and the namesake for Ranger Dell's trail). He shares his close partnership with CAMP as a financial case study for trailbuilding in other parks. "We have increased [profits] by 100 percent since they started." Bikes reach beyond the trails, too. Auburn is the venue for Bo Bikes Bama, an annual charity road ride led by one of the state's most famous alumni, Bo Jackson. On that day, you will find members of CAMP volunteering all over the course. Never mind that it's a road event, and they solidly prefer fat tires. That's how they roll. They're the kind of folks who would fire up the grill for their fiercest college football rivals–Alabama fans–without even spitting on the meat. "It's the people," says Hank Albritton, flipping meat on the ginormous grill. "Everybody wants to share what they have with everybody else." It's no coincidence that this is taking place in a football town of professional tailgaters. The population doubles during Auburn home games, when more than 87,000 fans pack Jordan-Hare Stadium and the roar can be heard for miles (this is a great time to have the trails all to yourself). These are people who grasp the power of grilled sausage. "I rearrange my schedule so I'm closer to the park on Tuesdays," says Brett Ezell, who says mountain biking phased in and out of his life, between drag racing and rock crawling, since he was 14. Now he and his wife, Brandy, ride with their fourth-grade son and rarely miss a cookout. "What lit the fire again was this crowd. Now if I have a week and there's no Tuesday, it's not a good week." These trails offer great riding in all four seasons. If you go in the fall, check the calendar for home games, when the campground will be full of tailgating fans (If you're not a football fan, the trails are all yours after kickoff). Park admission is $4 for adults and $2 for kids. CAMPING | Chewacla's campground has 36 developed sites ($25-$50) and nine primitive sites ($25) just minutes from the trailhead. The park also rents six cabins ($110-$170), most of them built on the 26-acre lake by the CCC and renovated in 2003. With grills and fire pits, they're a great option in the park but they book months in advance, so call early. WHERE TO STAY | The Hampton Inn Auburn is just outside the park. If you want the college town experience, the Hotel at Auburn University is right in the middle of things (though considerably pricier). WHERE TO CELEBRATE | You can almost always find the CAMP crowd gnoshing on authentic tacos at La Plaza Taqueria or Vietnamese noodles at Pho Lee. Near campus, The Hound is a great gastropub with craft cocktails and pork belly sliders by night as well as a singular Saturday brunch. Try the Redneck Benedict: from-scratch biscuits with fried eggs, house bacon and sausage gravy ($12).